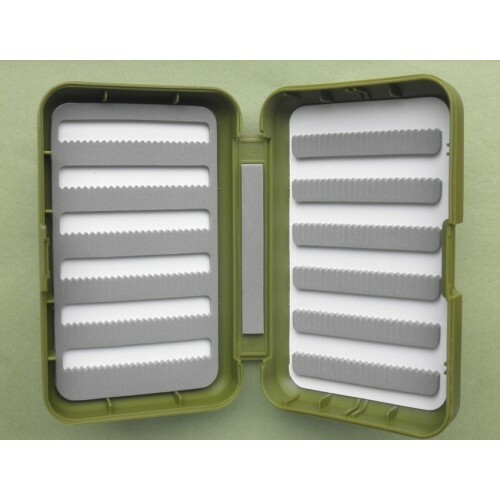 Richard Wheatley Comp-Lite fly boxes are constructed of tough, lightweight polypropylene with superior Easy-Slot and Easy-Grip foam that securely holds your flies without crushing or harming the delicate dressings. The innovative Easy-Slot and Easy-Grip design means tidier storage and also quick and easy identification of flies in low light conditions. Finished in a smart, unobtrusive olive green colour. Constructed of tough, lightweight polypropylene. Olive green. 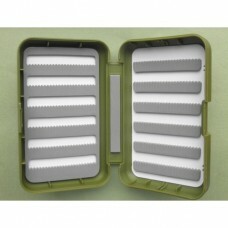 Easy Slot trout foam in lid & base. 6 rows of 4mm foam. For flies size 10 to 20. Size in inches: 6 x 3 5/8 " x 1 1/2 "